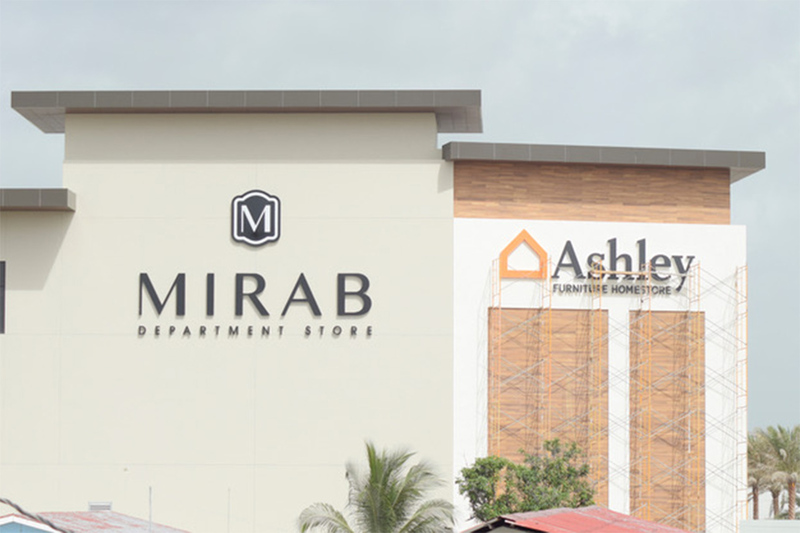 Belize City, June 28, 2018: Mirab and Co. a family owned business, is taking the consumer market to a whole new level, with its soon to be launched mega department store. The new store is located 1.5 miles on the Phillip Goldson Highway, Belize City, covering a square footage of approximately 100,000 square feet. This 3-story building is the largest department store in Belize. The new facilities will Welcome Home loyal shoppers with several outstanding new features, textures and sensory triggers that will provide a unique and pleasurable shopping experience. The biggest secret being disclosed is the announcement of the first ever Ashley Furniture Home Store in the country of Belize, which will be located on the 3rd floor of the new building. “We saw the potential for expansion a few years ago and decided to deliver on our promise for continuous improvement. We are grateful to our staff and customers and thought that it was time to offer them an upgrade to our existing facilities launched some 18 years ago.” For the family, the fine details and design which have gone in to this masterpiece has become a 4-year project of love and commitment to Belize. “It is important to keep evolving, and that is exactly what we are bringing to the market with our new store. Belizeans can rethink crossing borders to find great brands at great prices for their homes, because they will now have an even wider selection in their local market that can be purchased immediately in an amazing first world shopping environment. It will be more than a large department store; and we look forward to welcoming all shoppers to their new home” – says the Creative Director at Mirab & Company. For those of you who still love to browse Mirab’s Furniture Gallery on the George Price Highway, it remains open to display the other brands you have come to know and love. For your convenience we will remain at the entrance of both highways to home happiness. The new store will include new and improved merchandizing, an aesthetically pleasing environment for customers and upgraded service delivery in added checkout counters. New features include escalators, elevators for easy mobility from floor to floor and a financing station will be built for credit customers to apply for payment plans through Mirab’s Sister Company, Suncredit Limited. There are other conveniences such as a large and safe parking lot, as well as a bus stop for customers travelling via public transportation to reach the store. Consumers will now experience a one stop convenient shopping for all their home needs including furniture. The new store with its new logo, slogans, communication channels and continued commitment to Shoppers in Belize is planning to open its doors late Summer of 2018.